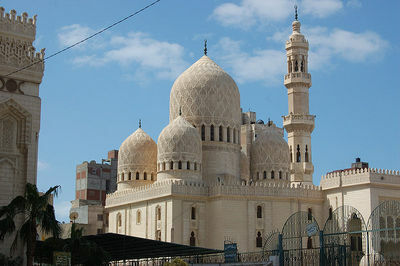 Al-Mursi Abu'l Abbas mosque, Alexandria, Egypt, attacked by Wahhabis in 2011 -- Photograph 2008 via Wikimedia Commons. In nearly all the Arab revolutions in North Africa and the jihadist offensives that followed them, incursions against Sufi shrines have preceded the onset of wide-scale radical aggression. As they initiate their invasive strategies, terrorists linked to al Qaeda and inspired by Saudi-financed Wahhabism (alias "Salafism") start by targeting the spiritual Sufis and their ancient tombs and monuments for murder and destruction. This devastation has several motives. First, assaults on the Sufis, an introspective tradition in Islam proscribed by extreme fundamentalists, are the most efficient way of announcing to conventional Muslims the arrival of a narrow, rigid, and totalitarian style of observance allowing no variation in religious practice from that dictated by the new overlords. Second, the terrorists condemn the habits found among most (though not all) Sufis, embodying mutual respect for the other religions and their particular esoteric doctrines—especially Christianity, but also Buddhism and others. Third, as adherents to peaceful dialogue and human coexistence, the great majority of Sufis are seen by the extremists as ineffective in defending themselves. Finally, the radicals see Sufi maintenance of tombs and devotions to Muslim saints as violations of Islamic monotheism. Egypt and Libya—historic centers of Sufi activity—saw outbreaks against Sufis simultaneously with, or immediately after, the end of the former dictatorship in each country. 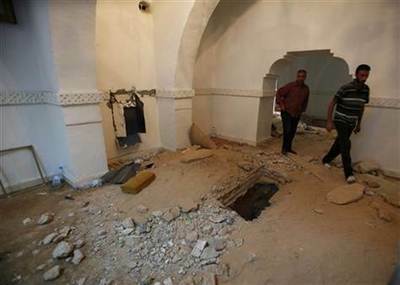 Wahhabi mobs invaded Sufi installations in Alexandria, Egypt, Tripoli, Libya, and Tunisia and Morocco. The places marked for demolition were long-established, locally-beloved sites. None of these attacks had to do with the overthrow of the previous rulers; they were motivated instead by fanatical hatred of the Sufis. 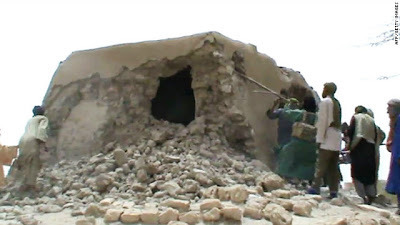 Wahhabi destruction of a Sufi tomb in Timbuktu, 2012. In Mali, a center of moderate Islam for centuries, the annihilation of the region's ancient Sufi heritage has continued even as terrorists fight against disrupted national authorities, intervening French military forces, unruly Tuareg separatists, and each other. At the end of last year, Abou Dardar, speaking for the al Qaeda-aligned Ansar Dine (Volunteers of Faith) announced, as reported by BBC News, that "not a single mausoleum" would remain intact in Timbuktu. Four structures were leveled in a single day, with pickaxes used to wreck mud-brick buildings. In addition, Dardar promised a search for "hidden mausoleums" in the area, which would be obliterated. Such nihilistic rage is not limited to Sufi and other Muslim cultural legacies deemed offensive to the fundamentalists. In November 2012, an Egyptian cleric, Murgan Salem al-Gohary, called on Muslims to flatten the Pyramids and the Sphinx, in imitation of the Taliban's 2001 artillery bombing and dynamiting of the Bamiyan Buddhas in Afghanistan. Members of the Egyptian Al Nour or "Party of the Light" appealed for a less drastic option: covering the statues of the pharaohs from public view. As in their opposition to honoring Sufi saints, the radicals argue that ancient effigies may encourage prayer to multiple deities and idolatry, although worship of the ancient gods and veneration of the pharaohs has been absent from Egypt for more than a millennium and a half. Egyptians, nevertheless, are not uniformly passive in dealing with Wahhabi/"Salafi" belligerence. In the Nile Delta governorate of Al-Qalyubya, townspeople fought the radicals in 2011, and again in November 2012, residents organized a "human shield" to protect the Sufi shrine of sheikh Muhammad Al-Nabarawy. Fundamentalist Shia Iran has also seen incidents of resistance against ongoing repression of Sufis, identified by the Islamic state with other "enemies:" Christian converts, Baha'is, "Zionists," and Sunni Muslims. In mid-January 2013, members of the Gonabadi-Nimatullahi Sufi order in the large central-western Iranian city of Shahrekord found one morning that regime agents had broken into a private courtyard and destroyed a large tent set up to accommodate weekly ceremonials led by the local chairman of the Sufi group. 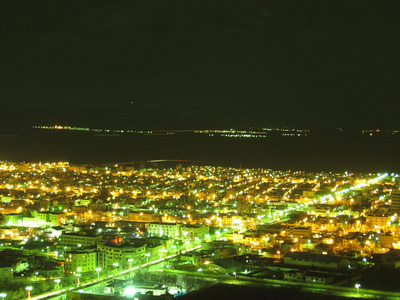 Sharekord, Iran -- Photograph 2010 Via Wikimedia Commons. The two occupants of the property, Mansour Saffarian and Mehdi Davari, protested against the intrusion and were arrested. But according to the International Organization to Preserve Human Rights in Iran (IOPHRI), neighbors unaffiliated with the Sufi group gathered quickly to obstruct further interference with the property. They summoned other Sufis who were attending a funeral, to repel the government's interlopers. IOPHRI said the two arrested men were released on probation, but that some 4,000 Sufis camped around the house during the night to prevent further raids. Fire trucks and Iranian Revolutionary Guards (Pasdaran) arrived at the Sufi protest. The Sufis accused the Pasdaran of planning to burn down the house, an anti-Sufi tactic applied previously at the theological center at Qom, in the western Iranian city of Boroujerd, and on the island of Kish along Iran's southern coast. 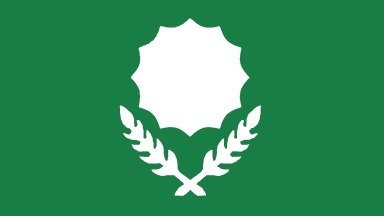 For two days Shahrekord, a city of some 150,000 people, was in tumult, according to IOPHRI. About 2,000 Sufis stood guard against their militant opponents, while on January 17, the mayor of Shahrekord delivered an ultimatum demanding evacuation of the Sufi house. The Sufis expressed fear that the Basij, or paramilitary thugs serving Tehran, would attack the crowd. The Sufis claim that their assembled followers remained at the location and that the forces of state repression withdrew. But the Sufis reiterated their position toward clerical government: They "are not submissive to [supreme leader Ali] Khamenei and his ideology." 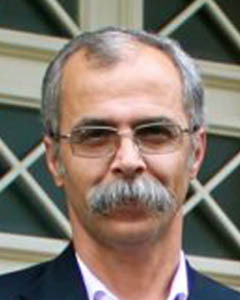 Other Gonabadi-Nimatullahi Sufis have suffered official Iranian repression in recent days. On January 28, two Gonabadi Sufis, Saleh Moradi and Kasra Nouri, in jail in the southern Iranian city of Shiraz, were reported by Iranian dissident media to have completed the 14th day of a hunger strike. The incarcerated Sufis had begun the action in opposition to transfer of seven lawyers and webmasters for the Sufi group to solitary confinement in Tehran's notorious Evin prison. The day before, on January 27, Hamidreza Moradi, the webmaster for the group's Majzooban Noor (The Alluring Light) website, a prisoner in Evin, was beaten brutally by guards. He vomited blood, and was then left naked and exposed in the cold of the prison yard. Iran is one of the countries in which Sufi Islam developed, and the activities of the transcendental adherents in pursuing social justice has added to their prestige among ordinary Muslims. Similarly, a South Asian Sufi sheikh from the conservative Qadiri order, Muhammad Tahir ul-Qadri, founded the Minhaj-ul-Quran (Quranic Path) international movement. A resident of Canada in recent years, Ul-Qadri appeared in his native Pakistan in December. There he launched a flamboyant effort calling for millions to march against the corruption of the Islamabad government. Ul-Qadri received worldwide attention in 2010 with issuance of a 600-page fatwa denouncing terrorism. Minhaj-ul-Quran is widely known among Pakistani Muslims in the West. To the majority of traditional Muslims, Sufis are known for their good works, care for the disadvantaged, and defense of the oppressed. 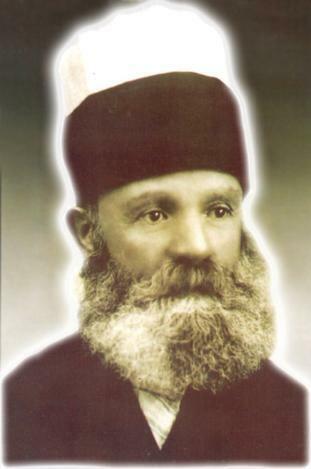 On January 24, Albanian media reported a belated recognition as "A Patriotic Martyr" of Sali Niyaz Dede, a leader of the Bektashi Sufis who was executed in 1941 by the fascist Italians for refusing to recognize Mussolini's occupying army as the masters of Albania. At the same time, Albanian authorities honored the Bektashi poet Baba Ali Tomorri and his colleague Baba Shefket Koshtani, assassinated by the Communists after World War II. The Bektashi Sufis are distinguished in their support for secular government, popular education, and gender equality. Dede Haxhi Baba Edmond Brahimaj,kryegjysh (head) of the Bektashi Sufi order, receives honors to Sali Niyaz Dede from Albanian defense minister Arben Imami, January 24, 2013. In representing an Islamic alternative to fundamentalism, radicalism, and state tyranny, it is predictable that Sufis would targets of jihadists. Unfortunately the image of the Sufis as otherworldly individuals involved exclusively in escape from the bonds of ordinary existence persists among non-Muslims, including those concerned to counter radical ideology. Global policy makers remain reluctant to favor differing Islamic interpretations, on the pretext of non-interference with religion. But one thing seems certain: Where the Sufis are victimized, ordinary Muslims and non-Muslims will soon come under attack. Confrontations between Sufis and their enemies are not a minor detail of Islamic life. The atrocities against Sufis in Egypt, Libya, Tunisia, Mali, and other countries should be recognized by foreign observers as reliable warning signs of approaching homicidal jihadism against foreigners, modernists, and moderate Muslims.